Phoenix Contracting Services performs power monitoring & load studies of your electrical system. 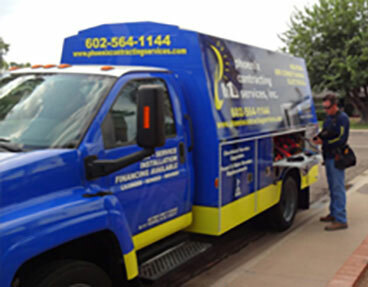 Phoenix Contracting Services provides unique services that other electrical contracting companies do not offer. We perform power monitoring & load studies of your electrical system which means we can monitor and record your power usage as well as other helpful data in order to create graphs and other descriptive information regarding your powers performance. This is very helpful when needing to find out what your current electrical load is on your existing electrical system. It is also beneficial when trying to identify an electrical power anomaly, event or even record an electrical power failure on a specific piece of equipment or appliance. As a separate service, we aid in the collection of electricaldata necessary for engineers to create reports for power monitoring, arc flash and selective coordination studies. Appliances, electronics, equipment, and machinery can be damaged when subjected to power anomalies. One or two seconds of outage or a surge is enough to cause major issues in your electrical system. A critical step in ensuring reliability in your electrical system, is by monitoring the power quality and doing a load study. A load study will tell you how many watts each electrical component consumes over time. Monitoring power quality and load analysis can help identify the cause of power system disturbances and even help identify problem conditions before they cause power interruptions or power disturbances.